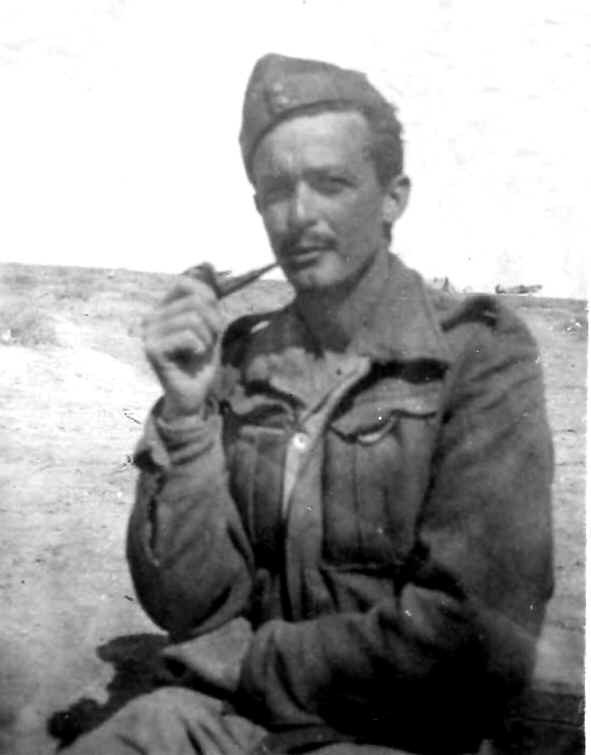 he was transferred to 33 Sqdn surviving Greece and Crete and the war. I'm afraid I don't know precisely when my dad was posted away from 112. I enclose some further extracts from his memoirs (edited to exclude some of the more personal passages) in case you feel it might contribute something extra to the site. I may be able to dig out some of his old old photos for you (sorry, but this won't be for a while yet). 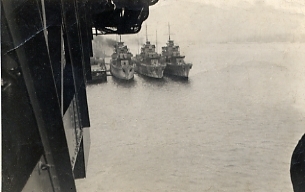 I was left at Hullavington only for another couple of months before a telegram arrived with the message “Report HMS Argus, Middle Slip Jetty Portsmouth Dockyard, for embarkation duties” and so very soon I found myself on the dockside, looking up at a large grey aircraft carrier. There seemed to be only one gangway, which I somewhat nervously climbed - to be greeted by whistle-blowing and the salute of a naval officer resplendent in full uniform, complete with telescope under his arm. As a reflex, I took my hat off as I stepped on board (what I later learned was the Quarter Deck and which must always first be saluted whenever it is stepped on). To my infinite relief, I was then met by an extraordinarily pleasant Lieutenant Commander who, on learning my credentials and inexperience, told me “embarkation duties” were already being handled by the crew - and suggested my best course of action was to go off home for the weekend, which I did with alacrity, to Eastbourne. 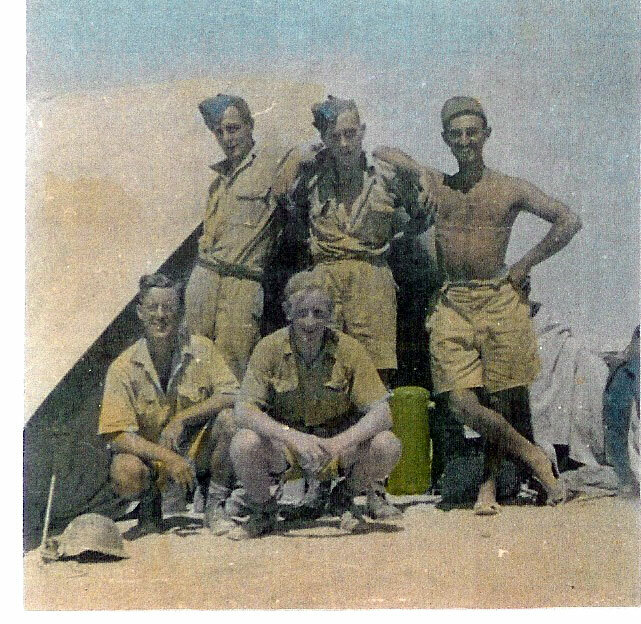 I think I was then given 14 days leave, during which I was required to equip myself with tropical (khaki) service and mess kit – the former including a topee. And so ………….. I returned to Portsmouth. 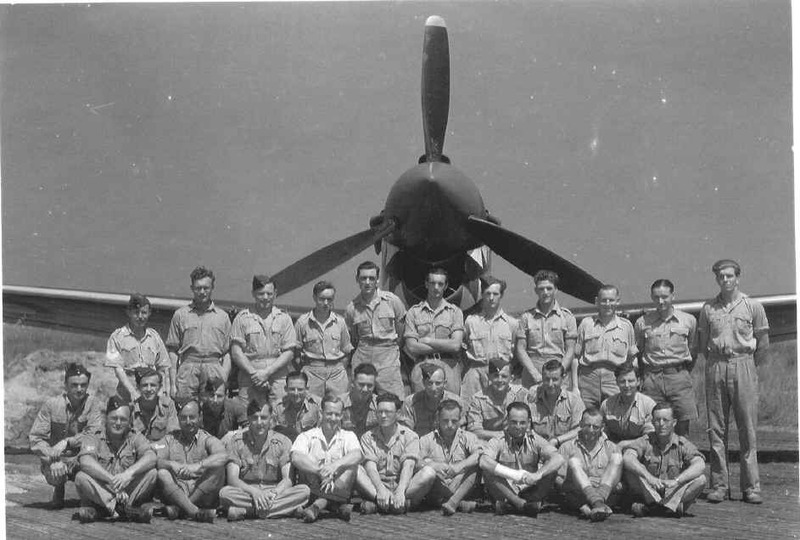 On board, the wardroom quickly filled up with a hastily assembled group of officers under a Squadron Leader, three Flight Commanders and an assortment of junior pilots, who comprised No. 112 Squadron. 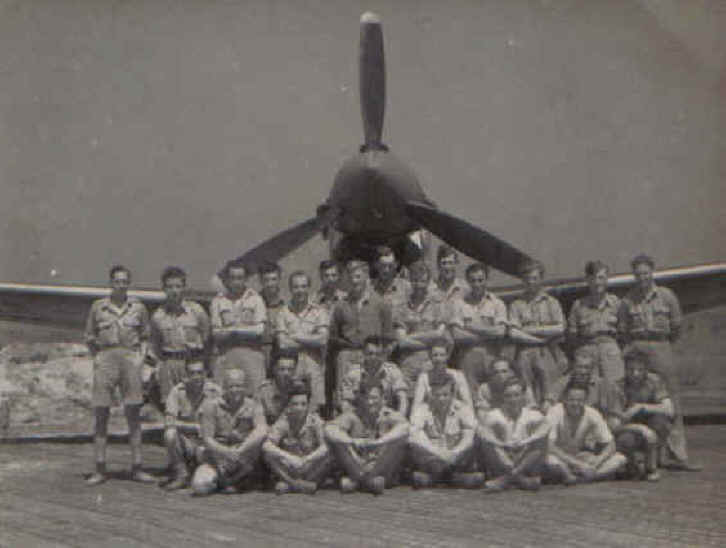 Twelve Gladiator aircraft were brought aboard, squadron personnel allocated cabins and we were ready to sail. The voyage to Egypt – about 11 days – was uneventful and, for me, exciting. We were required to play our part in shipboard routine – daily “divisions” on the flight deck, accompanying the Commander on his rounds, etc (I also learnt to walk with my hands together behind my back; and to get a taste for the wardroom drink of gin and little silvery onions – at tuppence a glass). Arrival at Alexandria was an ordeal. I had never before encountered such heat, which we bore encumbered in our blue serge uniforms and inside what was, in effect, a tin can. So, entraining for Helwan – just outside Cairo – was a relief. But I remember looking out of the carriage windows at a dirty, sandy, sun-baked countryside and thinking “Please don’t let me die and be buried in Egypt”. 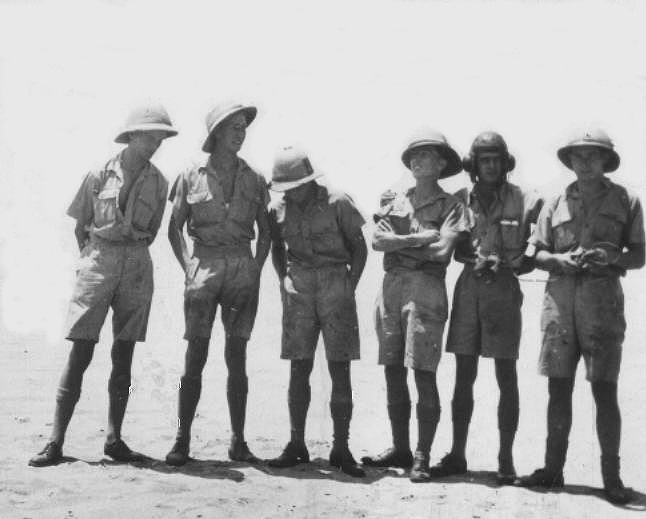 Helwan turned out to be a level stretch of desert, surrounded by a fence and containing a collection of brick and wooden buildings, forming the RAF Station. 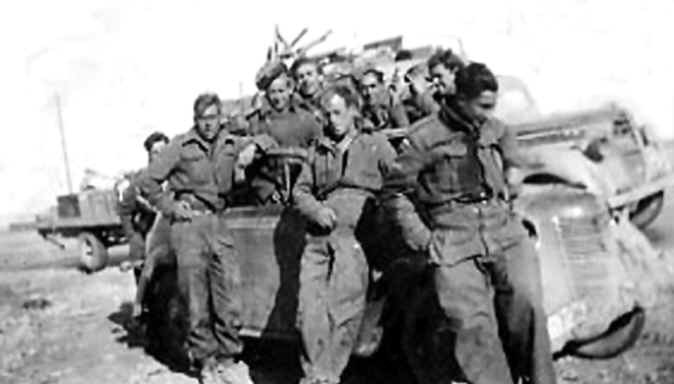 Helwan village – about 10 miles east of Cairo – was within walking distance and was where many of the married personnel were in lodgings of one sort or another. The camp was well-equipped with all the necessary facilities, including an open-air cinema, swimming pool and a school for Station children. My immediate boss was a Flight Lieutenant Manson,….. Under his tutelage, I began to have an inkling of the duties of an Equipment Officer. There was a squadron (No. 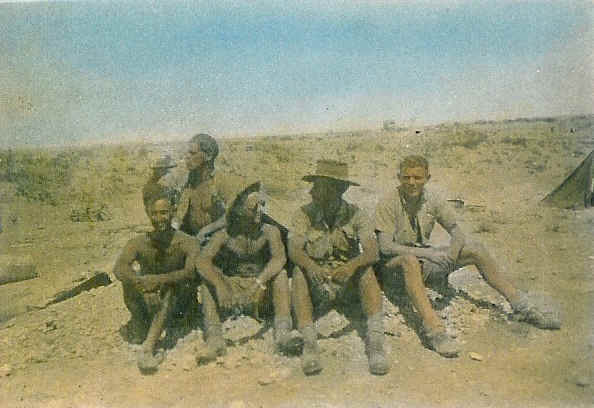 45) of Blenheim Bombers already in occupation, having fairly recently been redeployed from Khartoum. Very soon, however, I was uprooted from Helwan and posted to RAF Ismailia, a Station on the Canal, to join No. 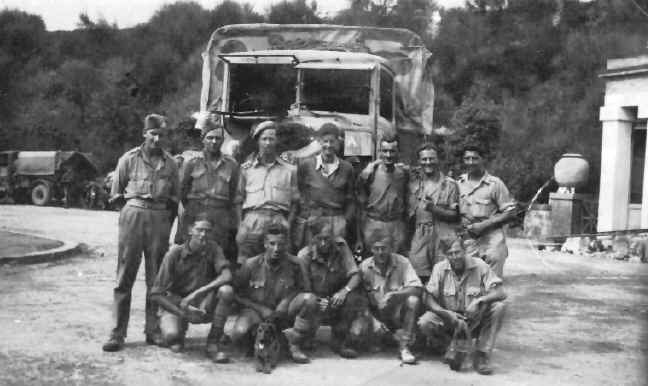 33 Squadron, a mobile (i.e. self-sufficient) fighter squadron equipped with Gladiator aircraft, redeployed from Palestine. 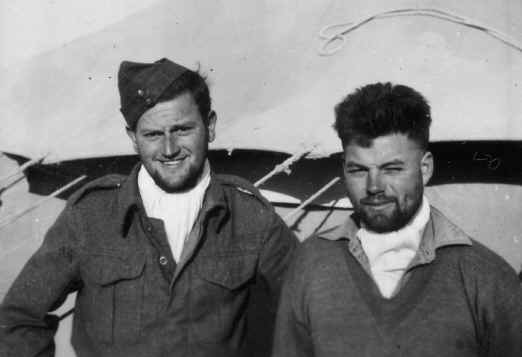 So, one afternoon, I was flown across from Helwan in the observer’s seat of an Audax - by a happy-go-lucky pilot, who walked out to the aircraft in his bare feet with his boots looped by their laces round his neck. 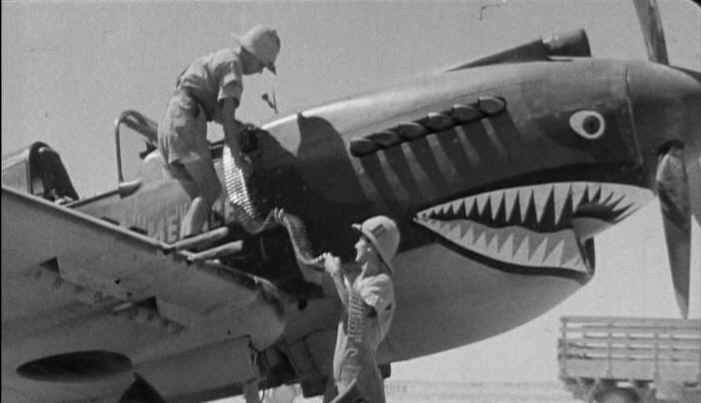 On arrival at Ismailia, however, I found that 33 Squadron had already left for Qasaba, a base landing ground on the Mediterranean coast in the Western Desert, about half way to the Italians in Libya. 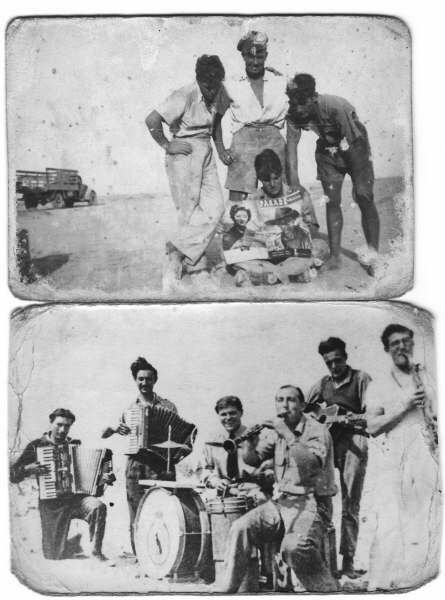 I think I again flew in the Audax, for I remember looking down over Cairo, the Pyramids and, later on, the coastline with the blue sea lapping the Mediterranean shore in a line of silver foam - and once again reflecting on the contrast with my life six months earlier in a Peckham gasworks. 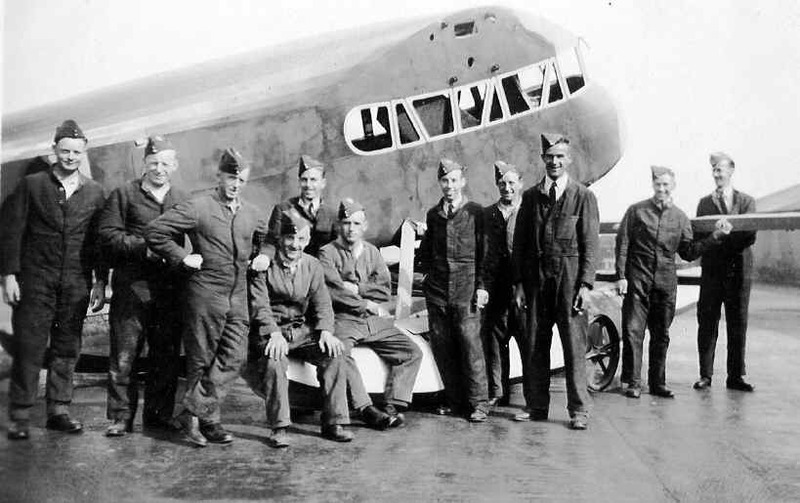 Titled August 1939 were the Ground Crew boys on course? Graduation from a Course? 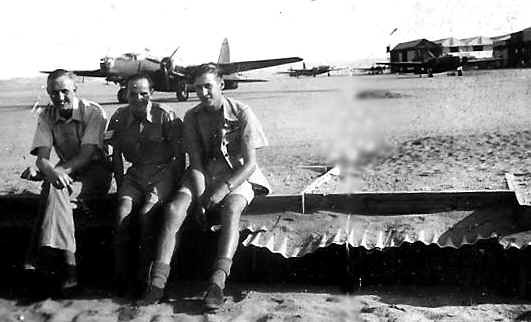 The Avro Anson in the background might have been from 4 FTS, Although the courses were shortened, the training syllabus was expanded to include instruction in night flying, formation and instrument flying and, for the potential Army cooperation pilots, reconnaissance and photography training. A Navigation Flight was formed in October 1938 with the delivery of 9 Avro Ansons from the UK. L to R LAC Bert Butler, LAC Monk (armourer), CPL Charnworth (or maybe) Churnworth, it's difficult to read. Johnnie Cowburn sorry no idea of service number he was one of my Dads' mates he came from Salford. 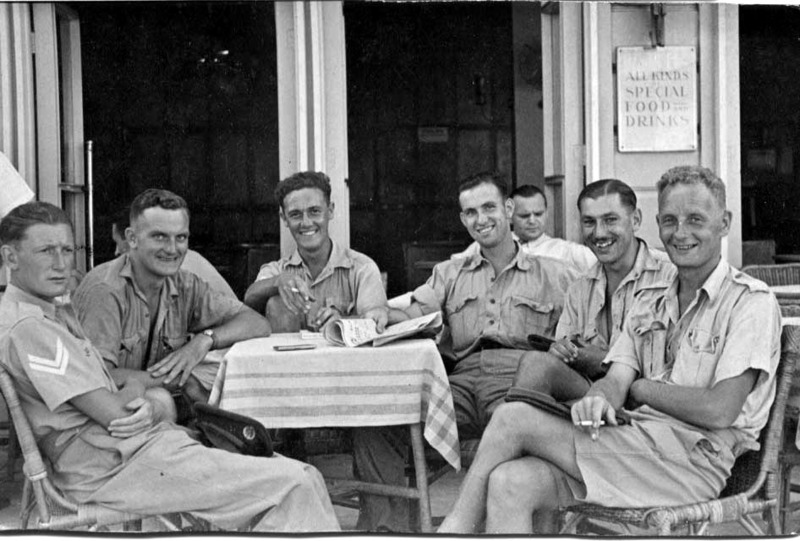 Off duty 1 my father LAC Jim "Harry" Hawkins, 546046, RAF, front row right and off duty 2 back row right. Sorry I have no idea who the other chaps are. 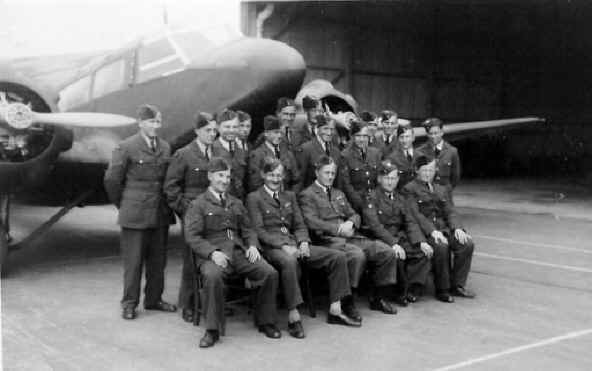 It was a great surprise to finally find a website featuring 112 Squadron and equally to find my Father in a couple of ground crew photos. 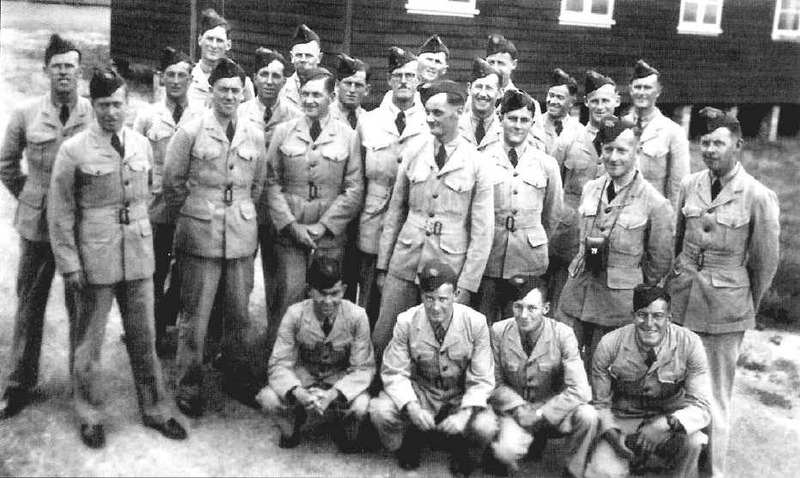 LAC Murdoch (Mac) Macdonald 535577 1936 - 1945 can be seen in a picture with LAC James W. Hawkins he is in the photo on the right sitting in the middle front row looks like he is in his underwear not uniform. I am sure that I have the same picture somewhere because I am sure I have seen it before, plus many others that I will be submitting in the future. I also have his service and discharge papers that I will rewrite and send to you. It is a shame my father is not here to appreciate the wonderful job that has been done to this website I know that it would bring back a lot of good memories as well as sad. 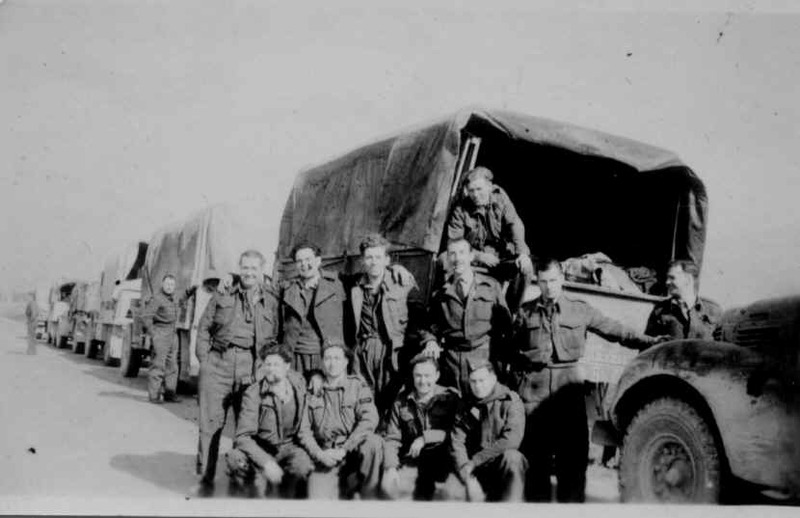 Bill King from Cumberland, Ben Farley from Surrey, Arthur Masters came from Kent and when he returned from Italy he was at Rochester airfield for a while, Jock Sinclair from Greenock and Victor Kaye, 747198, RAF, from Brighton the dog was either Jerry or Terry not sure which. 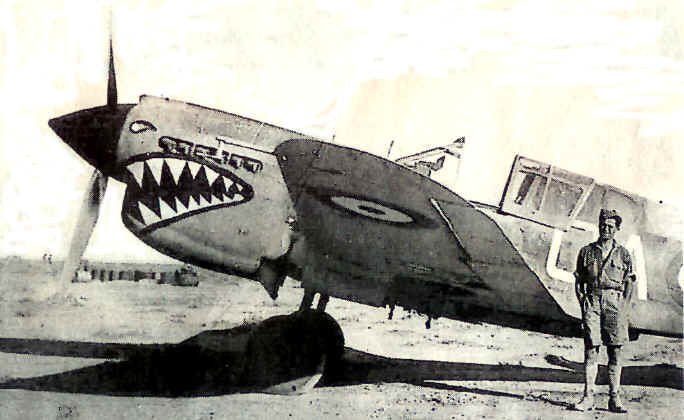 Cpl Robert "Jock" Sinclair, Fitter IIA,(F.IIA (Airframes)),.from Greenock on the wing of F/O David Musther, Mustang Mk IV, KH776 coded GA ?. into the French Armee de l' Air, so only 11 served in Greece as only 24 of them where made under the Greek contract. Greece could not oppose this air force on equal footing. The fighters available to the Greek Air Force included 36 PZL P24F of Polish design divided into three Squadrons the 21st, 22nd and 23rd with ten aircraft each and in which the defense of Salonicco, Kastoria, Kozane and Larisa were entrusted. There were 9 Bloch MB.151 of French design equipping the 31st Squadron to protect Athens . Greek bombers included 9 modern French designed Potez 633 equipping the 31st Squadron, (leaving the two above to be further identified? ) 12 Bristol Blenheim Mk I equipping 32nd Squadron and 10 Fairey Battle Mk I equipping the 33rd Squadron. Reconnaissance units were equipped with 16 German Henschel Hs.126 and the navy had 10 Avro Ansons and 9 obsolete fighter biplanes, the Fairey IIIF. Aleksandar Ognjevic has identified planes as Greek Potez 633 (bomber version). 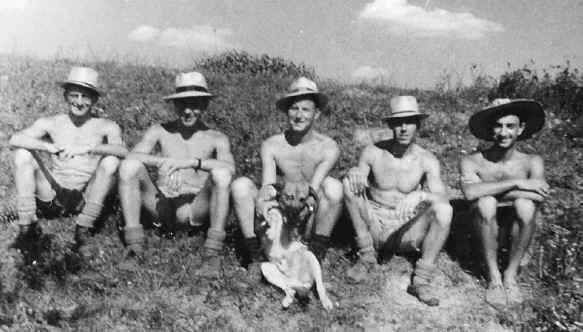 Enlisted ?/ 02/40 N Africa, Greece (Yannina Aerodrome) , Crete, Cyprus,. 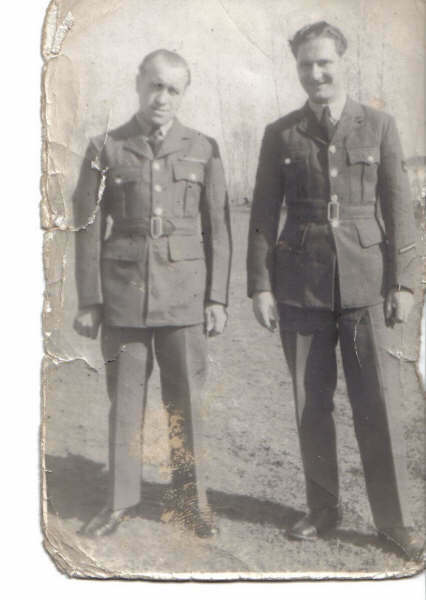 Commissioned to RAF Regiment 26/07/43, fellow on the left is unknown at this time. This picture appears to be 1944 or 45 with a Mustang in the background which would make it somewhere in Italy I think. Airman Harry Futcher seated on the running board, straw hat resting his arm on the rear fender. Note the Shark emblem on the truck. Thanks Tom Hubbard this is a wonderful photo you have shared with us. 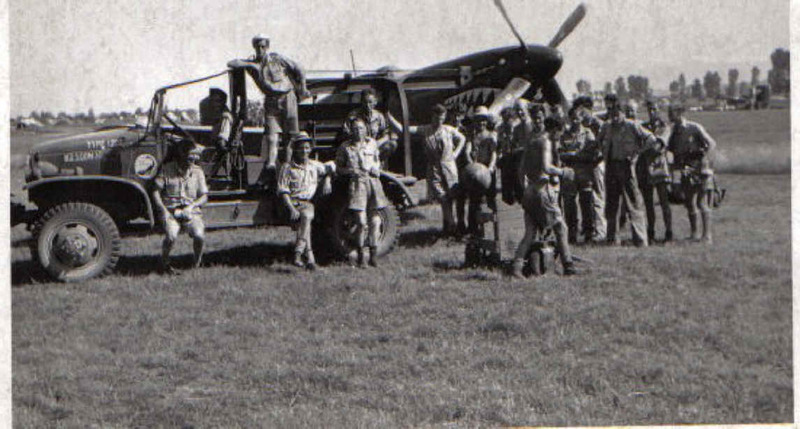 As the plane and location seem to be identical to the pilot photo found on photo page 1943 continued, I will take a guess that this is the ground crew on the occasion of Squadrons Fifth Birthday 17 May 1944, Italy. Thanks again Tom Hubbard wonderful to see the men that made the flying possible now does anyone have some names and service numbers to go with the faces? 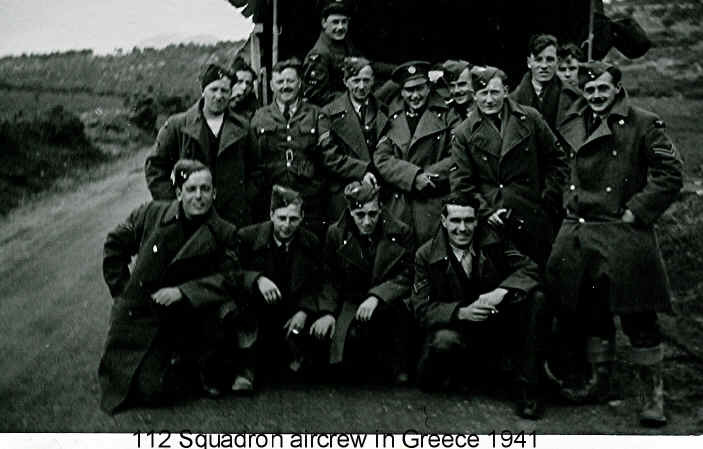 In comparing this picture to the photo of the Ground Crew in Greece (below), many of the faces become familiar not as Pilots but as 112 Sqn Ground Crew Members. 1942 location unknown. 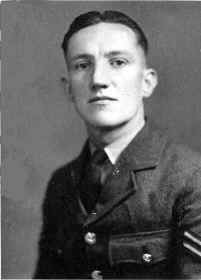 My father (Jim Tunnah, from Edinburgh, Scotland) served in 112 squadron in WWII. Unfortunately he died just before his 80th birthday in 2001, but in going through my fathers papers I came across a few things, including a record of his travels with 112 squadron written into the cover of an RAF New Testament bible he had kept from that time. 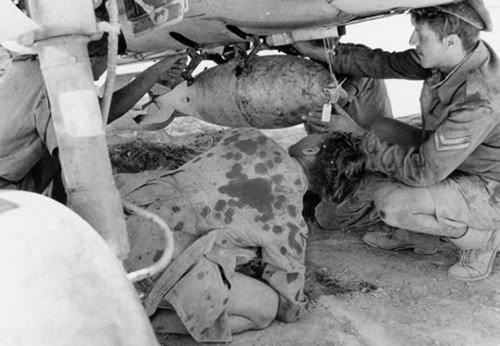 Three members 112 Squadron ground crew rig up a bomb load, could this be the same Corporal as seen in the above photo? 1 June 1942. LIBYA., WESTERN DESERT. 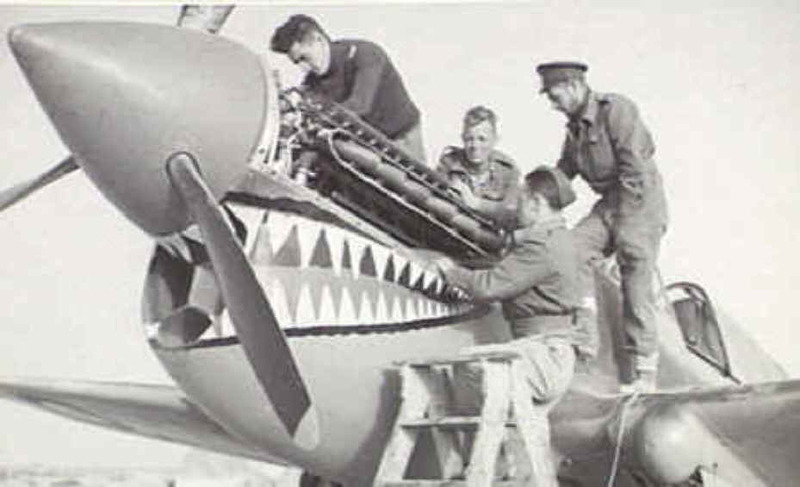 GROUND STAFF AT WORK ON A "KITTYHAWK" AIRCRAFT OF THE "SHARK" SQUADRON R.A.F. FIGHTER UNIT OPERATING IN THE DESERT. 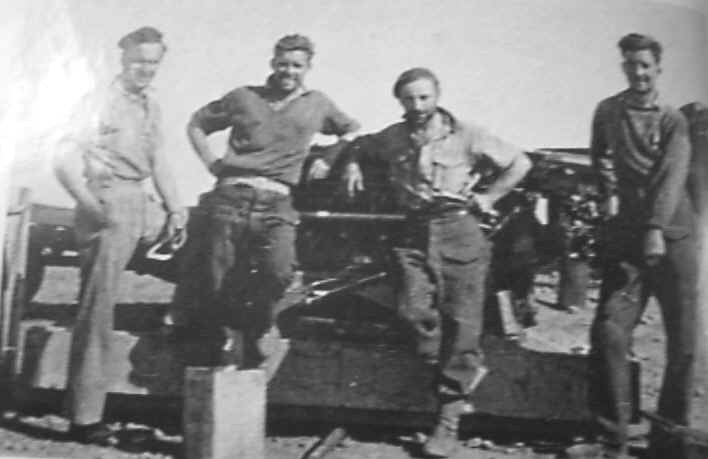 Left to Right Sgt Bert Butler, LAC Jack Cookson, "Jock McLennan (of McLennan barge fame Crete) and Jim Worsford all Fitters II E at El Adem, December 1941. This is to let you know that I’m not to have the chance to accept your invitation to visit you in Umtali. I am leaving for home shortly and although I have tried to get leave to come and see you, I have been all the time on a day –to -day system of waiting and now in about a week or so I shall leave the Colony, ultimately to go home. Believe me it was my dearest wish to have the honor of speaking with the parents of my old boss, who was by far the finest type of officer it has been my privilege to serve. 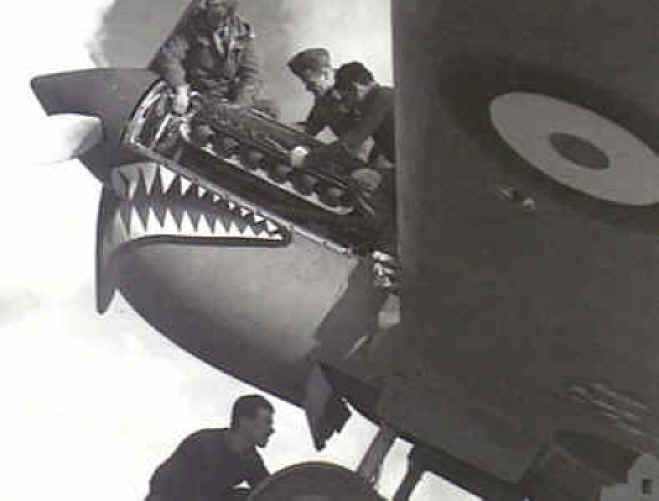 I am enclosing a snap of Mr Bowker’s aircraft – it was his own particular ‘kite’ and in it he did things that no one who served with our beloved 112 Sqrn can ever forget. As you’ve never seen me I’d better tell you that I’m the corporal standing second on right. You can imagine what the conditions were like by looking at our general rag-tag appearance. Now I’m going home to get married and there’s a request I’d like to make. Permission from you to name any of my kiddies ( and I intend to have one or two believe me) after your son. We know him as Neville but of course what his second name might have been I do not know. And if my yougster grows up to be as fine and courageous as yours I shall be satisfied. If you would like to drop me a line before leaving, please do so. And next time you write to Mr Bowker, please tell him his old fitter will never forget him and that he wishes him with all his heart speedy return to Rhodesia. Thanking you for asking me to your home. Robert Day remembers his days in the RAF serving in a Kittyhawk squadron. 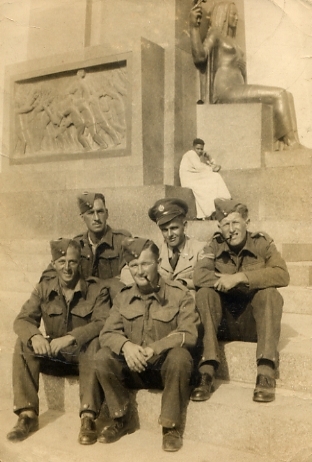 Robert Day holds his memories dear to his heart, especially as he reminiscences of days gone by when he served in the Royal Air Force of Britain in the war. 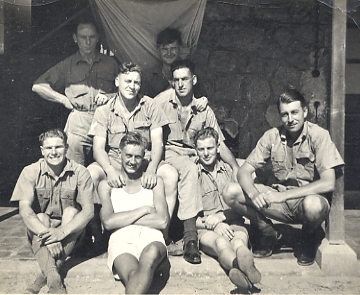 Nowadays Mr Day dutifully sits in a rigid armchair in his room at St.Michael ’s Residential Aged Care in Ipswich, eager to relay a yarn or two of his days in the RAF and his move to Australia with his wife and children all those years ago. Sixty years ago seems like a lifetime to most of us, but to Mr Day he recounts his time in the RAF like it was just yesterday. 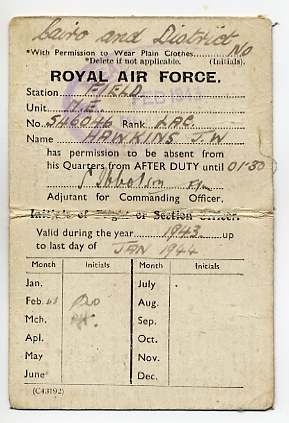 Once he turned 18 years old he decided the Air Force was the way to go, and enlisted along with six other schoolboys all from his hometown street in London. After joining the RAF he became an armourer on the Kittyhawk at 112 Fighter Bomber Squadron where he describes his job as looking after the bombs and guns. 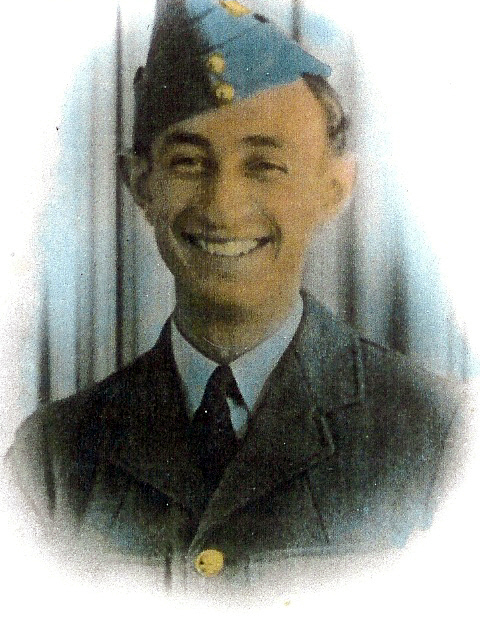 During his time in the squadron he worked with two assistants on two aircraft at a time in the Middle East. 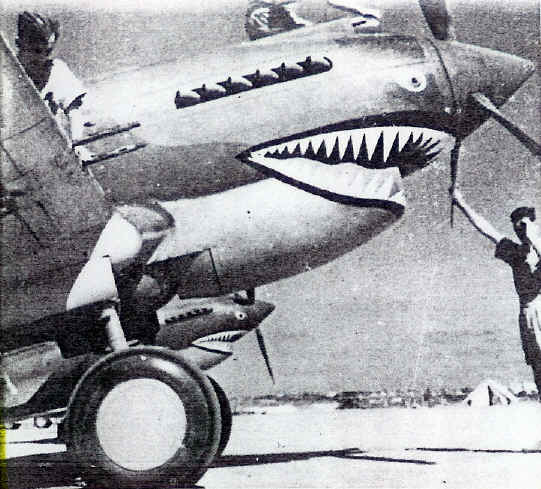 One particular day of the war is prominent in the veteran ’s memory: the day he saw his first aircraft that had teeth painted on its front that made it look like a shark. 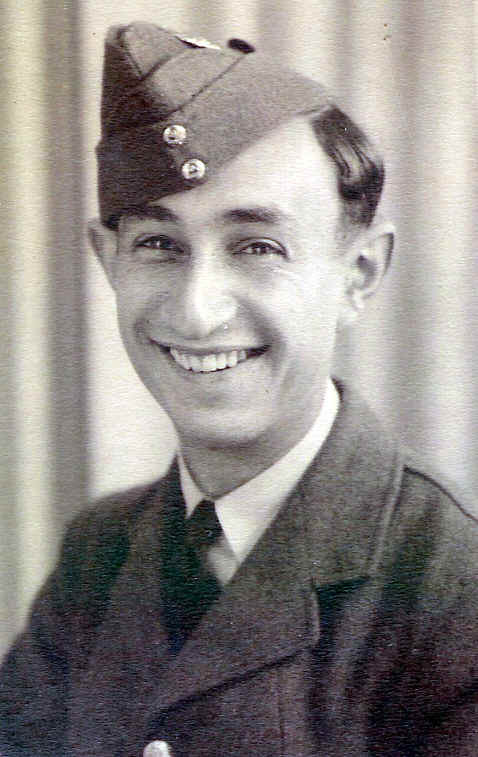 On this day he and some other RAF personnel were told to wait for the aircraft to arrive, and they soon saw the aircraft flying one behind the other around the aerodrome. 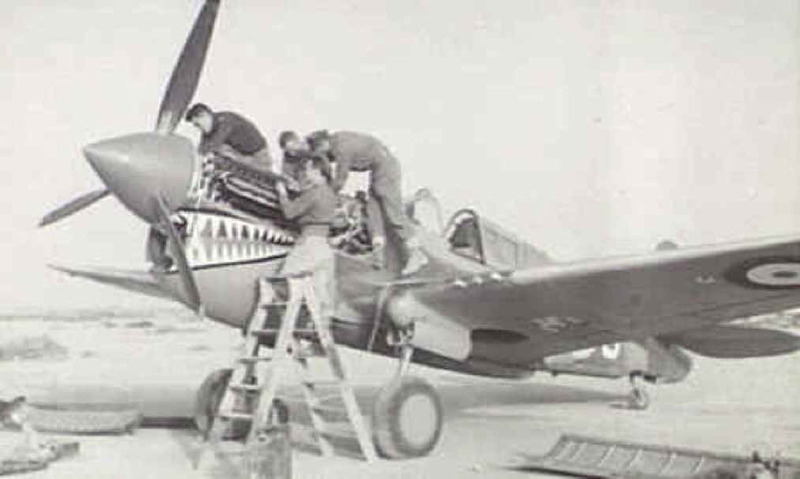 Mr Day recounted that when the aircraft were ready to land one of the men waiting said what they were all thinking: “they look like sharks.” The painted shark ’s teeth took the imagination of the squadron as they proceeded to organize a template of the teeth to be painted on their own Kittyhawk aircraft. 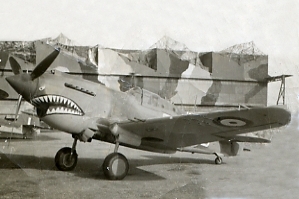 The 112 Squadron was then the only squadron in the RAF that had the painted shark ’s teeth on the Kittyhawk, according to Mr Day. 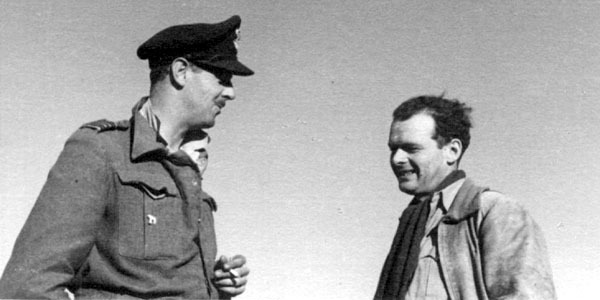 His time in the RAF during which he was posted throughout Europe and the Middle East was acknowledged with numerous campaign medals. 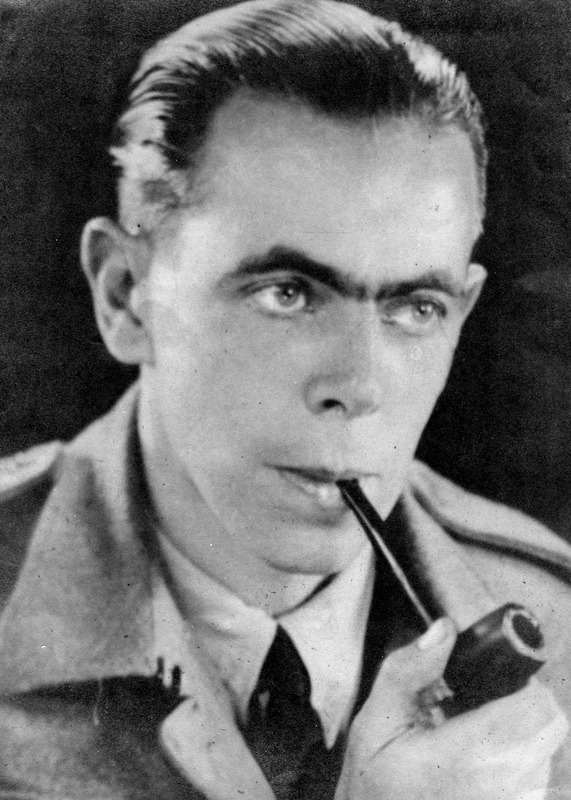 Mr Day was awarded the decorations of the Middle East Forces 1941-1943, Central Mediterranean Forces, BLA 1940, African Star and Clasp, 1945 Clasp, Italian Star, France Star, Germany Star and the General Services Medal. 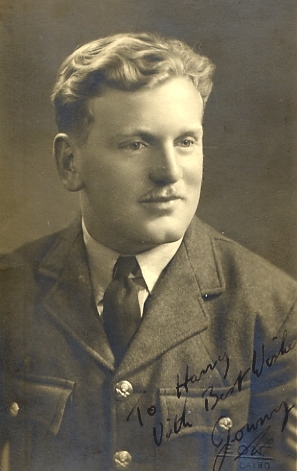 During his wartime service Mr Day was associated with many Australian pilots who would encourage the young man to go to Australia after the war. He said the pilots told him how Australia always had “beautiful sunshine, no cold weather, plenty of work, easy to get a house, plenty of jobs. 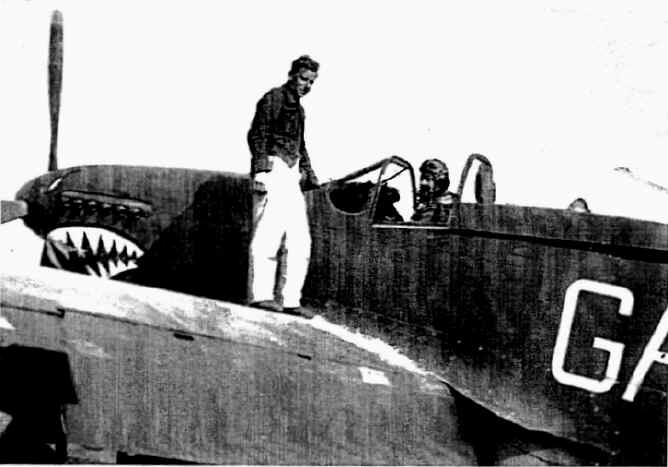 ”At first he said he thought the men were making it all up, but after at least half a dozen pilots from Australia kept telling him the same thing, he decided to see what the fuss was all about for himself. In 1951 he, his wife and their first daughter landed in Australia. His first job in the country was as a station hand, but not enjoying that work he decided to get a job in a car factory as a welder. He was so efficient in his job that six months into it he was promoted to foreman and worked from 1951 until his retirement in 1976 at 60 years of age. 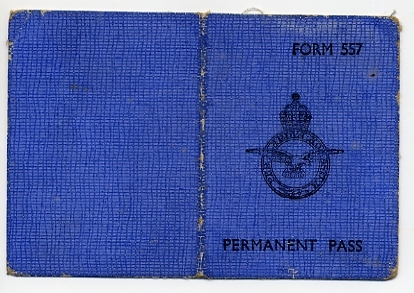 Mr Day keeps a treasured scrapbook of photos and memorabilia of his time in the RAF and his love of aircraft. 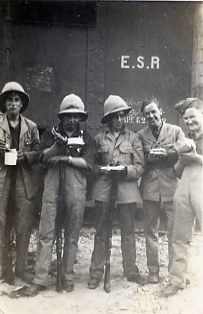 Photographs of the young Mr Day, mates grinning in uniform and enlistment certificates along with other keepsakes fill the scrapbook. His affiliation with the Kittyhawk bomber aircraft is apparent, as today he owns a scale-replica of a Kittyhawk along with a plush pillow bearing the aircraft on its stitching. Today, however he is a long way from his days in the RAF, as he enjoys the quiet life of St Michael ’s and the regular visits from his family members along with an occasional beer.